Camp season is upon us, and not just for kids. 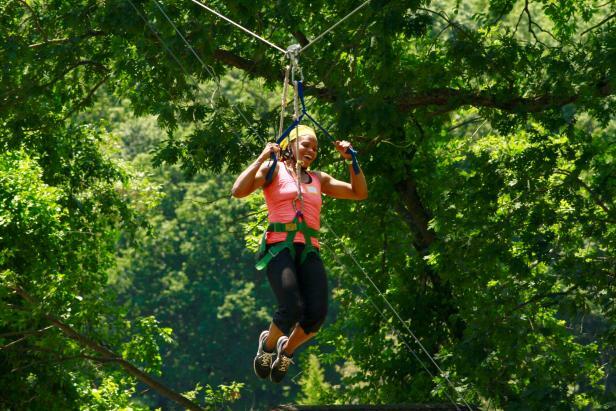 Even though adult summer camps have become a thing in recent years, an entire weekend with strangers can seem daunting at first. Enter the day camp option with Soul Camp, a wholesome health and wellness sleepaway camp designed to be welcoming. To prove it, I tested it out for myself. Adult summer camps can be hit or miss. I know, since I’ve attended a few, and the experience has ranged from Best Ever! to Never Again. 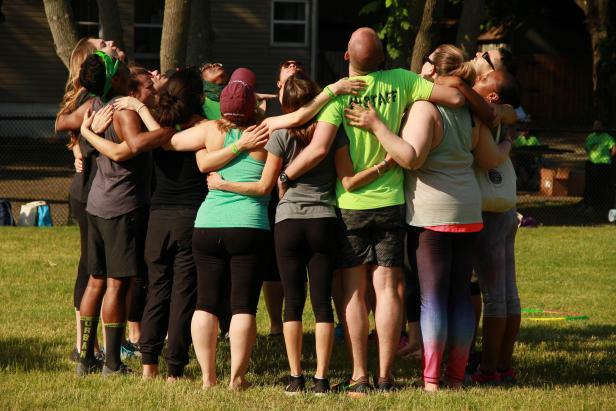 So when I had the chance to attend Soul Camp’s first day camp, it sounded like the ideal way to try it out without committing to a weekend of (potentially) forced fun and games. Plus, I’ve long since aged out of the alcohol-soaked frat scene that dominates many adult camps nowadays. 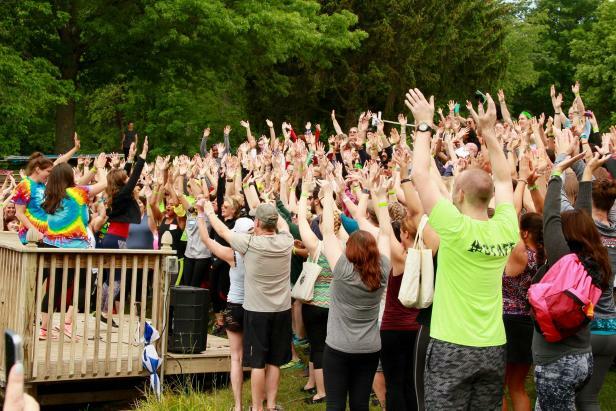 Soul Camp is more akin to a yoga retreat, except with camp counselors and a greater range of activities. In theory, it sounded like a much better version of the day camp I attended as a kid. Thanks to Google Maps we finally arrived at a busy registration in time for squad assignments. Mine was Real-life Unicorns, while Raj was assigned to the all-male Woo Crew. (About 25 percent of attendees were men.) Several Wu-Tang jokes from my husband, two hugs from strangers and a cold-brew coffee later, I found my fellow unicorns. My new squad of 16 or so quickly welcomed me. We went around the group with introductions: fun facts, superpower, intention. Skipping to the latter, I said my intention for the day was to learn — I was in work mode, after all. More normal responses involved having fun and meeting new people. From there Soul Camp officially opened with welcoming speeches by tie-dye clad founders Michelle Goldblum and Alison (Ali) Leipzig. I learned that campers came from as far as Texas and Canada. It seemed that almost half of the 250 attendees were repeat campers, and some have attended every year since Soul Camp’s 2014 inception. In fact, one of the original attendees told me she’s maintained friendships outside of camp. 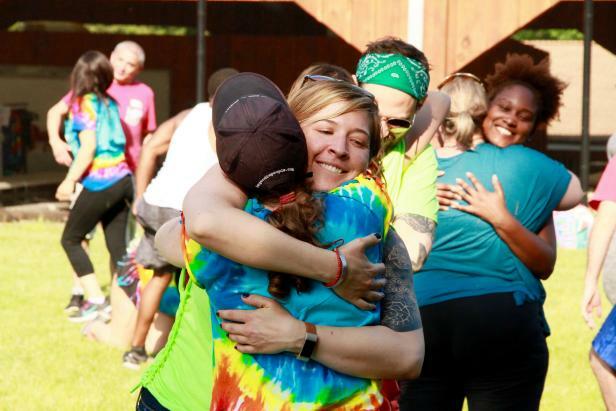 While I imagine it’s easier to form tight relationships at the overnight options, many people came to the day camp solo, and plenty of interactive exercises (and endless hugging) encouraged getting to know your neighbor. 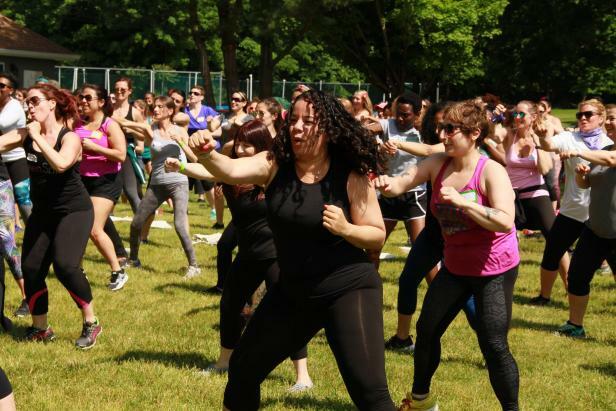 Michelle and Ali launched Soul Camp, an adult sleepaway camp for all things mind, body and soul, in 2014. 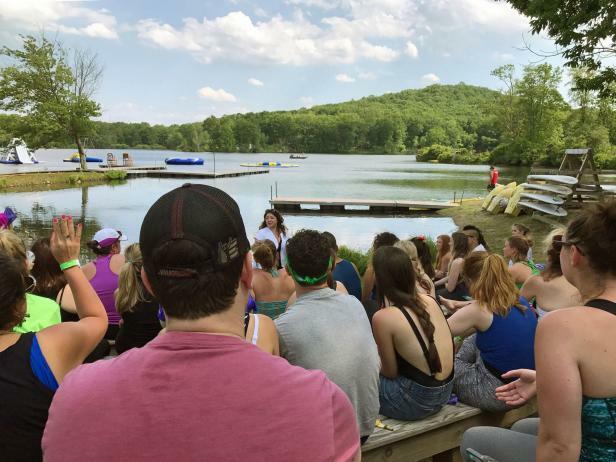 The inaugural camp went down at Camp Towanda in the Poconos — yes, the one from Wet Hot American Summer fame. However, that fact was the only commonality, since potential campers should know from the start that Soul Camp is alcohol- and drug-free; no spring break shenanigans here! 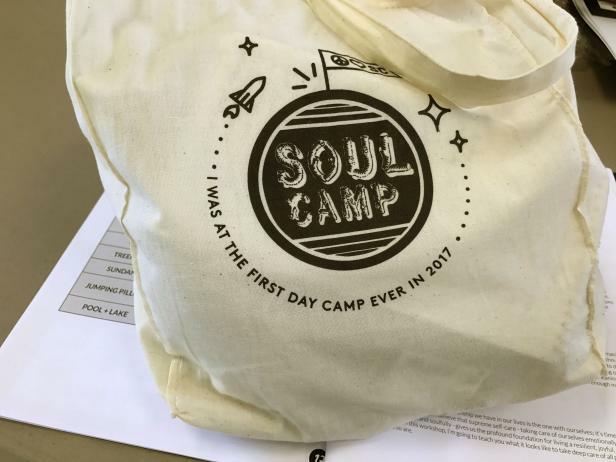 After a successful launch, Soul Camp has since expanded across the country, with 2017 bringing upcoming sleepaway camps in California and New York, along with the first day camps in Chicago and New Jersey. As with all the camps, the Jersey camp was structured into periods, following a traditional camp format. Unlike the day camps of yore, it kicked off with a camp-wide activity led by intenSati founder Patricia Moreno. Popular in NYC, intenSati involves simple cardio choreography while repeating positive affirmations, such as “I co-create my reality!” Oh, and there was lots of high-fiving and hugging in between sets. After a sweaty hour of this, Raj and I beelined to the well-stocked snack area for healthy bars, bean chips and fruity teas. Luckily the snack area was available throughout the day, as were water fountains and clean, modern bathrooms. Thanks to snack dilly-dallying, we got off to a late start for Period 2. Among the 12 options were classes in numerology, cardio dance, and Heal Your Soul + Body with Cookie Dough. (It did involve actual cookie dough.) Raj immediately gravitated to an archery class; overwhelmed by choices, I wandered about. After taking a few minutes to get my bearings and figure out the map, I set off for the rock wall/zip line area. The rock wall area was empty as about a dozen or so campers were waiting for the zip line, with more arriving. Although after watching two women scream their way across, I opted to check out the archery area. 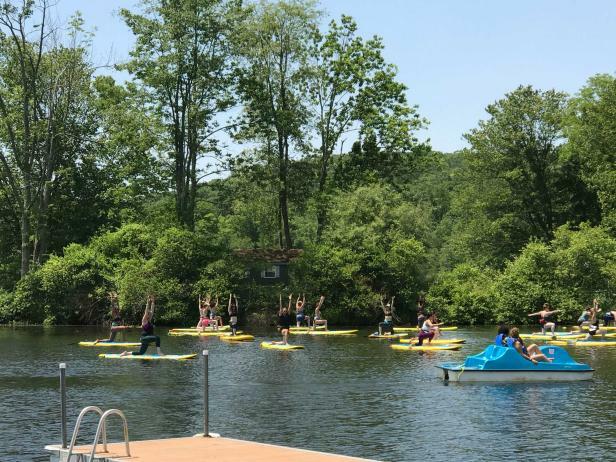 Archery was similarly crowded, so I made my way to the lake, where I immediately regretted not arriving on time for the standup paddleboard yoga class. After a few minutes of FOMO suffering, I picked up the Soul Camp program guide and found a tip page, including a sage reminder that we’re each creating our own perfect adventure and not missing out on anything. Well then. By this point it was time for lunch, so Raj and I reunited and made our way to the open-air mess hall for turkey wraps and caprese sandwiches. Solo campers had the option to sit with their assigned squad — no reason to eat alone here! Free play followed lunch, and since it was a scorching hot day Raj and I struck out for the kayaks. It seemed many campers had the same lake idea. Around 2:30 p.m. it was on to Period 3, where nine new class options included meditation with Tibetan singing bowls, chakra clearing and self-care. Raj, who doesn’t typically join me at mind/body classes or events, stepped out of his comfort zone to learn about unlocking one’s psychic potential. Since I will do yoga every chance I get (trying to change that), I picked the Divine Movement Experience, a hybrid guided meditation, vinyasa flow and deep house dance party. 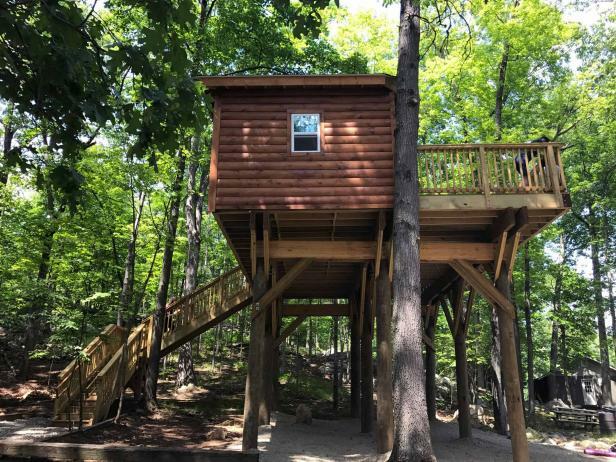 Plus, it was in a treehouse! Since I didn’t receive any special Soul Camp instructions before leaving home, I didn’t know I should bring my own yoga mat (FYI, bring your own yoga mat — and towels if you plan on swimming). But I arrived early, and luckily one of the instructors had a spare. Sometimes the universe provides. Off to a good start, we spent the next hour learning how to tap into our intuition and then practicing our skills with others. I chose Raj’s friend for one of the exercises, who just so happened to have spent the past three years studying intuitive work with Vanessa. The activity involved giving each other a reading about whatever you’re picking up about their life. I provided her one sentence. In turn, she was able to correctly nail a transitional period I’m experiencing, and even advised me on how to proceed. That information alone was priceless to me. Her reading on Raj, “Why am I here?” was also priceless. The day wrapped with an all-camp meditation, dance party, affirmations, and yes, more hugs. By this point we were pretty tired from all the fun, and I think Raj was hugged out. Now I get it, Soul Camp isn’t for everybody. But even though Raj would never attend by himself, he went in with an open mind and made the most of it, and was welcomed in return. And as with life, that seemed to be the point of Soul Camp. As for me, when I set the intention “to learn” that morning, I didn’t expect it would result in learning an answer to a question I’ve been asking myself for months. I also learned that Soul Camp is the closest I’ve experienced to recreating the camps of my youth — except a thousand times better.